Identification. Christopher Columbus sighted the Guiana coast in 1498 during his third trip to the New World. The French first settled the land one hundred years later, calling it Guiana, the French form of an American Indian word that means "land of waters." Location and Geography. French Guiana is on the northern coast of South America. It is nestled between Suriname to the west and Brazil to the east and south. It covers approximately 34,750 square miles (90,000 square kilometers), about the same size as Indiana. The close proximity of the equator (which lies a few degrees south) contributes to the hot and humid climate, which averages 80 degrees Fahrenheit (27 degrees Celsius) all year. There are three main regions: the coastal plain in the north, a hilly plateau in the middle, and the Tumac-Humac Mountains in the south. Most of the interior (83 percent of it) is dense tropical rain forest. There are more than twenty rivers that flow into the Atlantic Ocean from French Guiana. The most important of these are the Oyapock, which forms the southeastern border with Brazil, and the Maroni, which forms the border with Suriname. Demography. The 1998 population in French Guiana was approximately 167,982. 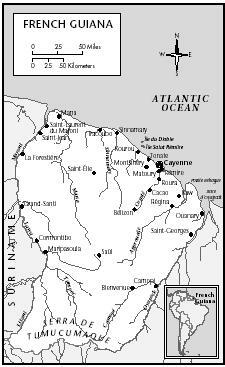 Around 40 percent of the population lives in the capital of Cayenne. African and Afro-Europeans make up 66 percent of the total population with Europeans making up another 18 percent and east Asians, Chinese, Amerindians, and Brazilians making up the remainder. In the sparsely populated interior the Oyampi and Palik tribes still follow a traditional pre-columbian way of life. There are also a few tribes descended from African slaves who escaped from plantations to live a lifestyle similar to their native central Africa. Linguistic Affiliation. The official language is French. All business and most common dialogue is conducted using the mainstream French. The native tribes in the interior, however, use their own language, and the African tribes use Taki-Taki, a pidgin English. Symbolism. The heavy influence of the French culture is evident throughout the country, and in the capital many of the customs and attitudes of France predominate. Emergence of the Nation. The Arawak Indians are the people first known to inhabit French Guiana. The next major waves of people were the Caribs. These peoples came from the Amazon and traveled to the Antilles (most of the islands of the West Indies). The Caribs displaced many of the Arawak. During the age of discovery and Christopher Columbus's journeys, the Caribs were still traveling through the Caribbean. The French were the first Europeans to settle in French Guiana. They arrived in the early 1600s, when many of the European powers were colonizing the Americas and looking for the lost city of gold, El Dorado. Between the climate and Indian attacks the first settlement was a failure. In 1634 the French settled again and this time they did not leave. Cayenne was founded as the capital some time later and it has remained the country's largest city. of agricultural failures and culminating with the abolition of slavery in 1848, most of the plantations closed. One of the agricultural settlements located in Kourou became the infamous Devil's Island penal colony. France had sent many political prisoners to French Guiana during the French Revolution; now the most hardened and notorious criminals and dissidents were also sent over the ocean to the penal colony. In nearly one hundred years of operation Devil's Island received more than seventy thousand prisoners. All camps were closed in 1945. Twenty years later Kourou was once again in the spotlight of France and receiving its people. This time, however, scientists—not prisoners—were arriving, to construct and operate the European Space Agency's rocket-launching center. In 1946 French Guiana ceased being a colony and became an official overseas department of France. The 1980s saw the rise of a pro-independence party, but ultimately the group lost power because the majority of French Guianese support being a part of France. National Identity. In the political and cultural sense there is no national identity. The nation for the French Guianese is France. The diversity of ethnic groups and the lack of common history add to the problem of internal national identity. The Amerindians living in the central part of the country seem to identify the least with the French and European way of life. Ethnic Relations. A complex weave of ethnicity and culture forms French Guiana's population. The Creole population, itself a large mix of ethnicity and culture, comprises the largest ethnic group and has had the greatest influence on the country's culture. Fewer than one hundred of the native settlers, the Arawaks, currently live in the central part of the country. The Caribs have a few small communities along the coast and have mingled with the Creoles. There is also a noticeable settlement of Vietnamese who came over in the early and middle parts of the twentieth century. The cultures interact fairly well and inherently adopt and adapt to local flavors. Considering the small population, the larger culture is forced to recognize all of its peoples. With the exception of the Amerindian tribes in the interior, most people live in one of the cities. Cayenne alone has 40 percent of the population. Houses range greatly in size and uniqueness, but the relative prosperity that results from living under the French flag allows the houses to be built of decent quality, and almost all have running water and electricity. They are usually painted light colors such as blue and yellow in keeping with the Caribbean Creole style. Small gardens are often annexed to the houses. The Amerindian residences in the interior are usually simple thatched roof huts, following tradition. Food in Daily Life. The diversity of cultures has given the local foods their flavor. Caribbean and Creole style foods are common along with Western foods and such Asian cuisines as Vietnamese and Chinese. Seafood, especially shrimp, is eaten quite often. Rice accompanies most of the dishes. 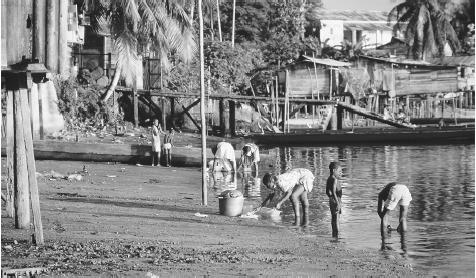 Children washing clothes in a river in Saint Laurent. More than twenty rivers find their way to the Atlantic Ocean from French Guiana. major economical asset. The space agency has become the second most important asset, with predictions for even more growth. Forestry of the untapped interior holds economic potential. Sugar-cane and other cash crops are grown by the agricultural sector. Commercial Activities. Family members still comprise the farm labor. Locally grown vegetables and fruit are sold in markets along with fish and meats. The demand for livestock is heavy and likewise can be profitable for the sellers. Small craft-work is sold to both tourists and locals. The building materials for these crafts and for carpentry projects are also sold. Among the major buyers of these materials are the many small-scale construction companies. The service sector is also important at the local level. Major Industries. The major industries are shrimp and fish processing and aerospace. Lumber and construction are secondary industries. The agricultural products are sugar, rice, manioc, cocoa, vegetables, and bananas. Cattle, pigs, and poultry are the main livestock animals. Trade. The major exports are shrimp, lumber, gold, rice, rum, rosewood essence, and clothing. In 1997 the exports totaled $148 million (U.S.). France bought the bulk of the products, more than 60 percent, with the United States, the European Union, and Japan buying the rest. French Guiana has always bought much more then it sold, resulting in high trade deficits since its inception. In 1997 the country imported $600 million (U.S) of goods, such as processed meats, grains, machinery, fuels, and chemicals. The largest import partner is of course France, with Germany, Belgium, and the United States making up the remainder. A large national debt has accrued because of the constant trade deficit. Division of Labor. The total labor force in 1997 was 58,800. The bulk of the labor force (60 percent) fell within the service, government, and commerce sectors. Industry accounted for 21 percent and agriculture 18 percent. Unemployment was at nearly a quarter of the total labor force and affected mostly younger workers. The fishing and forestry sectors rely on local, many times unskilled, labor. The space center in Kourou employs some of the most educated persons in the world. In addition to scientists, the space center employs numerous lower-skilled workers to pave roads, construct buildings, transport goods, and perform service functions ranging from food production to hotel management. Classes and Castes. The heavy subsidization by the French government has resulted in much more disposable income than if the country would have to rely on its own products alone. This helped create the highest standard of living in South America. The rural parts of the country see the least of the relative prosperity. Symbols of Social Stratification. The common indicators of wealth in the Western world are also relevant in French Guiana. These include French-fashioned clothes, larger houses, and education. Government. French Guiana is a part of the French Republic and thereby subject to the same regulations and political hierarchy as France. There is a general council that handles local affairs and the relationship with the republic. It is composed of sixteen elected officials from each canton. They elect a president of the department. Regional councilors are elected by proportional representation of the political parties. This council involves many of the same tasks as the general council but focuses more on long-term economic issues. A prefect, appointed from Paris, technically has the most power in the department but is usually relegated to military and security duties as the local officials are given more say in the running of the country. Two deputies and one senator are sent from French Guiana to Paris to serve in the national parliament. The judicial branch is the same as mainland France with the highest local court based on the Caribbean island of Martinique. Leadership and Political Officials. The leader credited with exerting the most influence in regard to French Guiana becoming an overseas department is Gaston Monnerville. He was the elected deputy in the years 1932–1946—the last year of his service being the year that departmentalization was enacted. Another important political figure of the time was the mayor of Cayenne, Constant Chlore. He was the founder of the only communist party in French Guiana and became integral to trade union pacts. Since that time French Guiana has had a rotating cast of local politicians in favor of and against French rule. As of 2001, the locally elected prefect was Dominique Vian. 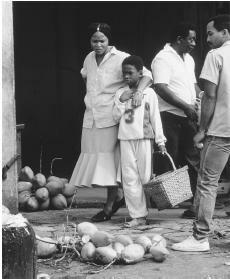 A street scene in Cayenne. French Guianese markets offer a variety of locally grown fruits and vegetables in addition to meat and fish. Social Problems and Control. French Guiana has had no major human rights abuses in recent times. Military Activity. The defense of borders is a responsibility of France. This military includes the French Forces and the Gendarmerie. The availability of men fit for service was thirty thousand in 1999. Local officials are in charge of social planning. European agencies, trade unions, and other associations with France are prevalent in French Guiana. Division of Labor by Gender. Women are generally responsible for tending to the children and other household tasks. The men are in charge of providing financial support. This holds especially true in the rural areas, although there is some variation among the different ethnic groups. 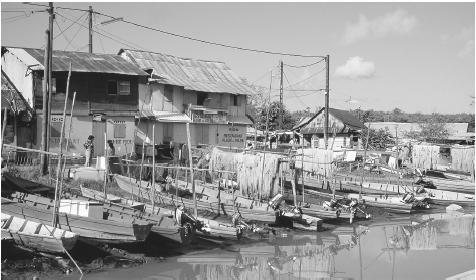 Fishing boats are moored on the bank of Laussat Canal, and fishing nets hang out to dry in Cayenne. Shrimp and fish processing are major industries in the country. Business and politics are governed by the French system. There is no systematic discrimination against women, but women tend not to be in the upper echelon of either field. Marriage. Most marriage ceremonies take place within the church, as is the custom in most of South America. Domestic Unit. Families have followed a Western trend of becoming smaller. The average birthrate is 3.31 children per woman. Regardless of size, families maintain their closeness through activities and religion. Kin Groups. As with families, the members of larger kin groups tend to be close and live within close proximity to one another. Child Rearing and Education. Schooling is compulsory until age sixteen. Primary schools exist all over the country, while secondary schools are located primarily in Cayenne and large towns. The educational system is the same as in France and has contributed to the literacy rate of more than 80 percent. Higher Education. Professional and university level students get their education overseas, usually in France. Because of the students' European Community status, they are granted all the same privileges as European students. French values permeate French Guiana. Dress is Western in style in the sense that light colors and short sleeves are worn in warm climates. The people are generally known for their friendliness, although the indigenous peoples in the interior see very few foreigners and therefore may appear to be wary at first. Religious Beliefs. The vast majority of French Guianans are Roman Catholic. There are many other religions practiced by the minority groups. These include indigenous Amerindian shamanistic religions, Buddhism, Hinduism, Islam, and Africanbased religions. Death and the Afterlife. The Catholic rituals are followed, including a cycle of prayers upon death and a funeral at which friends and family gather. All medical affairs are handled by the State Department of Health. This department works with such organizations as the Pasteur Institute to eradicate diseases. Vaccinations are free and compulsory for tuberculosis, diphtheria, polio, yellow fever, and measles, mumps, and rubella. There are high incidences of malaria (almost six thousand cases in 1995), dengue fever, and various sexually transmitted diseases. A number of AIDS cases have ended in death, accounting for approximately 10 percent of all adult deaths. There are seven medical doctors per ten thousand people, but these doctors are available only in urban areas. The average life expectancy is 76.4 years. All major French holidays are celebrated, including Bastille Day, Labor Day, and the Catholic holidays. Performance Arts. The various ethnic groups value dance and music. The urban areas listen to modern music; the tribes of African origin produce drumbeat-driven rhythms; and the Amerindians focus more on wind instruments such as flutes. French Guiana has perhaps more diversity then any other country in the world in this regard. The interior population has learned little or nothing of the sciences, while on the coast the European Space Agency leads one of the most sophisticated operations in the world. The future seems to hold more of this great divide. Burton, Richard, and Fred Reno, ed. French and West Indian: Martinique, Guadeloupe, and French Guiana Today, 1995. Gall, Tim, ed. Worldmark Encyclopedia of Cultures and Daily Life, 1998. Rajewski, Brian, ed. Countries of the World, 1998. U.S. Government, Central Intelligence Agency. CIA World Factbook, 2000.
we have a total of 50 things to find out for our country report and i found 38 things here this sight ROCKS!! Thank you for this information I had to do a French Guiana project and this really helped!!! Merci beacoup!! !This site really helped me alot to see the main facts of French Guiana, but also the culture and customs of the people. I'm doing a report on this counrty and it helped me on a lot I think its a alsome site!!! Ahhh, thanx soo much. I have a 9 1/2 page to write && this has helped a lot!!!!! THIS SITE ROCK!!!!!!!!!! !IT GAVE ME TONS OF INFO THAT I NEEDED 4 MY PROJECT!!!!!!!!!! thanks 4 the help i just need 1 more thing..... in the religion what do they pratice? Thanks i got my project done really fast without going crazy looking 4 information. thank you soooo much!!! this has helped me soooooo much on my french report!! all i had was devils island and now i have like five pages of culture!!!! I am doing a report on French Guiana and this has helped alot! i have to do a report on this place for social studies and i got most of it done with this one website yay!!!!!!!! Thanks for writing this article! It helped me a lot with a big project I did on the country. Great job! This page is awesome! This is the only website I could find with tons of info for my report on French Guiana! This is the best site for info on French Guiana! Thanks to who ever posted it! thanks a ton! I, too, had to do a French Guiana project report and this helped enormously! thanks! This site is sooo useful!! i would recommend it totally..... its very helpful and it gave me soo much information. haha. thanks alot. Hey, thanks for the site. It helped alot!!! i'm in 7th grade and we do get hard projects...well not anymore thanks to this site! thanks, so glad u had a bibliography! well written and informative. I had a group project and i found all the info i needed for the project on this website it's the best. I'm leaving in two weeks to live in French Guiana for six months and I knew hardly anything about it. Thanks so much, very informative. Thank you so much, this website is amazing. It has complete information and is very helpful. I will definitely visit this site again! Wow this website helped me the most! I recommend this more than WIKIPEDIA!!! Thank u sssooo much i waited 2 the last minute 2 do my french project and was going insane looking for the information i needed and this site helped me a lot this is wat i needed thank u!!! Wow this article rocks!! I had to do a report on French Guiana and this helped so much! Thanks! you dont even know how much diz helped uz wiv our skwl project. i've learnt more today than ive ever learnt about anything. we've really apprieciated dis helpful writing. thank u so much this helped me so much with my project u rock!!!!!!!!!!!!!!!!!!!!!!!!!!!!!!!!!!!!!!!! Oh my gosh this helped me so much on a paper that is due on thurs. thanks so much!! THank you very much! One of you photogrphy interest me very ùuch, the one on whoch the children washed their clothes because I grew there and I want to know where it was taken. If is possible. i love this website it rocks! i am doing a report on it i love it so continue the great and good work! this websight rocks my granny socks off! wow. thanks so much everyculture.com! Gertrude loves you. This site is a life saver! Hey, whoever posted this, do you have any more sites as good as this one? I seriously want to know! Oh, and another thing, do you know what a slogan or nickname for French Guiana is? That would really help alot, not that this didn't already though! Thank you so, so much for the article! I may not fail this project after all~! I love this websight! i have an intornatanal expo progect 4 frech class and this was a bug help! OMG so i have to do a 20 slide slide show thats due after christmas break and this helped me do 15 of my slides this site is amazing!!! Thank you for this site, it really helped. I have to do a project on this too. like seriously where is there seramones,traditional clothes, also there musems our some thing like that. This was one of the most helpful sites I've seen in a while. this site is helping me with my report for school!!! its really helpful. I REALLY WONDER that nobody has visited this web site & written his comment on a country with such a nice natural forest reserve?After seeing the photo on google my curiosity led me to this site!Earth is greeh & we can breathe fresh air because of countries like this! This Site is super!! THANX FOR IT. i truly miss home and feel comfort reading this site. this site is so helpful! doing a country project for class! got everything off here! I have seen a lot of French Guiana websites, and this is probably the best out of all of them. This site helped me so much. thank you to the creators of this site. Thank you so much!!! you saved me life wtih all this good info!!! THIS REALLY HELPED ME DO MY PROJECT I LIKE THIS SITE ALOT!! thank you very much. now im free from doing a seven big paragraph essay. :) thanks! I really appreciate this site. Thank you very much for sharing. I think that it is alot of help for me.And Ilove it alot to. What are the Do's and Don'ts of French Guiana? Please mention them! Is an income of $2,127 USD monthly enough to live on comfortably in French Guiana? Can you supply some cost of living information? LOL. This is like the only way to learn ANYTHING about french giana. The religion is roman catholic. THAT's all I learned from other sites. Thanks a lot. HUGE project due and only three days to do it. This website helped a TON!!! THIS SITE ROCKS I HAD TO DO A PROJECT ON THE FRENCH GUIANA AND I FOUND ALL THE INFO I NEEDED!!! Do you have any information about the main sport of French Guiana? I've found basically everything I need here except for the sports. Could you add them, if you have any information about them? Man I Felt That This Website Helped Me Alot And It Was Great And Provided Alot Of Valid INformation. it helped a lot for my history report. they had so much information in two paragraphs, that it took up 1/2 of my page!! im doing a power point on this and its helped me out so much! way more than other websites. This article was really interresting, but there is a lot more you can discover.. I'm also a french guianese person. So I invite the people who have to "deal" with, to directly search in french : "Guyane Française" intead of French Guiana. Or search commentaries on travel web site. The wikipedia page was actualised recently and the external links and references are truly helpful. Its a good article but it needs more about how the native arwaks and caribs reacted to the settlers of france and so forth. Thanks im doing a paper on French Guiana and this helped a lot! I am hoping for an A! This is a great website. I could not find information for French Guiana anywhere! This helped me complete my report. Thanks!! This helped me do a country report in 7th grade. So THANK YOU! And I think that you should have some longnitude and latitude. Thank you very much for this website,it helped me a lot. We have to do a research paper and I hardly know anything about The French. Thanks to you though I know more. I LOVE THIS!! It really works, doing project and like I said makes it easier. I have to do a report on this country, and this helps so much!! But one more thing: I believe they practice Roman Catholic, but other religions are also practiced by the minorities, including shamanistic Amerindian variations, Hinduism, Buddhism, Islam, and other African-based religions. Thank you. This was so helpful, i had to do a project for school and this was so great! I REALLY like this web site. I have a presentation due tomorrow and I didn't have anything for the healthcare so it helped ALOT. This website is so awesome it pretty much has everything I need for my school report. This really helped me with my French project. I found a lot of information and it was very helpful. I needed to make a project and i got a very good score because of this sight. I have found it useful as I am planning to visit my friend.But can you advise how I should procede? Same here with most of the above peoples. I have a project on French Guiana, and this was my "secondary source", so to speak. Thank whoever made this article. This site is pretty good! I would have liked a little more on the holidays, parties, and celebrations but that’s OK no one is perfect! Thanks for helping though! Livvy is out! PEACE! I love the cultural of french guaina am in love with your country.keep me update .. I came looking for one answer for a project of mine, and I ended up finding multiple. Not only that, but I learned some interesting facts. This is a great website and it helped me a lot! :) I needed this for my grades and to improve and this did really help!